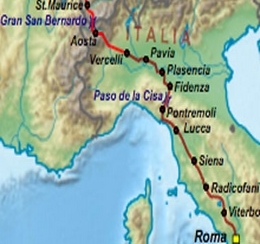 The Via Francigena in Italy starts in Aoste in Lombardia (or Great St Bernard Pass) and ends in Roma in around 45 stages. The leg that we describe here from Lucca to Roma crosses Tuscany by Siena and many villages with an outstanding heritage, churches, palaces, abbeys or castles at every stage. Arrival in LUCCA in the afternoon. Visit the numerous monuments of the city: Guinigi tower, Bernadini Palace, the Duomo, San Giovanni and San Frediano churches. The 2 squares San Michele and del Mercato are also must-sees in this lovely city. Dinner and night. The rural way leading to Altopascio is short but you will cross 2 churches dating back to the 7th century before entering into the fortified city of Altopascio where you will spend the night. Dinner and night. Today your steps follow a combination of paved roads, tracks and some remains of the medieval Via Francigena. Before reaching San Miniato you will cross the Arno River, the fortified village of San Miniato will enchant you with its palaces. Dinner and night. 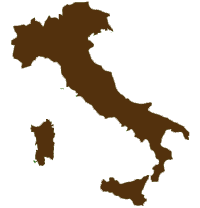 This stage marks the entrance into the Tuscany countryside far from the paved roads. The route follows vines and olive-trees on small footpaths. You will find back the road near the entrance of Gambassi Terme. Dinner and night. After Gambassi Terme the natural environment is exceptional. 13 km farther, the medieval San Gimignano surrounded by its walls seems to be unchanged for centuries. Dinner and night. This stage crosses Colle Val d'Elsa, an old city with numerous Renaissance palaces. When leaving Colle Val d'Elsa, you will walk through fields and woods before reaching Strove. Dinner and night. The path leads to the Isola abbey and then you will climb a steep slope up to the beautiful medieval village of Monteriggioni. Then you will walk on a dirt path and on stretches of the Via Apia, while discovering villages, farms and castles before reaching Siena and its Duomo, the Piazza del Campo, the former hospital. Dinner and night. Today you will leave Siena through the Porta Romana. The difference between the countryside of Southern and Northern Tuscany is striking. You will walk on a peaceful road and reach Lucignano d'Arbia. Dinner and night. From the nice village of Buonconvento, you will cross Torrenieri to arrive close to San Quirico d'Orcia, that you can discover on top of the hill. Dinner and night. Just after San Quirico d'Orcia, you will pass by Bagni Vignoni, a small spa village and walk on a small tarred road up to Gallina. From there you will take a small footpath through the countryside.Your steps follow the Via Cassia and then you will take the direction of Bagni San Filippo, a spa village where you will spend the night. The whole stage follows dirt tracks through a rural area. After San Lorenzo Nuovo, you will see the beautiful Bolsena lake. Then you will walk on a winding track across cultivated land and then finally reach Bolsena, a charming city on the Eastern shore of Lake Bolsena. From Bolsena to Montefiascone, you walk on shaded tracks and cross woods.In Montefiascone, the view over Bolsena Lake is superb ! You can take the time to visit Saint-Flavien Church and other monuments of the Center. Dinner and night. When leaving Montefiascone, you will walk on floor tiles from the Roman Via and you will cross hot springs before arriving at Viterbo.This fortified city abounds with treasures like the Pope’s palace and the Cathedral. The natural thermal swimming pools invite you to take a bath before heading to Ponte Camillario. A little farther a surprise is waiting for you : an Etrusca tomb that you can visit with a torch.The way to Vetralla crosses fields and woods. From Vetralla and its medieval center, you will cross the countryside to reach Capranica then you enter the walled city of Sutri enclosing an amphitheater dug into tuff as well as its necropolis. The first leg of this stage crosses rural areas up to Monterosi, where a variant leads you to a small lake adorned with lotus flowers. You will then find back the path through fields up to the waterfalls of Monte Gelato. Then you reach the Veio Park up to the doors of Campagnano. After leaving Campagnano, the views are outstanding over the Latium. You will cross Fornello, Isola Farnese and finally La Strota. This last stage will unfold through a urban area up to the heart of the Capital. Roma's treasures appear now under your eyes : Saint Peter’s Basilica, Sixtine Chapel, Saint Angel Castle, the Trevi Fountain and so many other wealths like the Borghese Villa or Piazza di Spagna….